Senior year of college has finally arrived which means so has IP. I have a little journal I've been keeping fragmented thoughts and ideas in, but a blog makes including links and images so much easier. Since I love making lists ... there's no better way to start out. So that reads all right as a list of interests on Facebook ... but I think most of those things are pretty inconsequential when it comes to thinking about a thesis project. Textures, patterns, vintage graphics, simplicity, nature. Packaging design (and graphic design in general). Better. I could delve into these topics at a much greater length. One thing we're supposed to do in preparation for this project is start collecting ideas and images, our own and others - I've more or less been doing this for about a year, just for my own personal benefit and here are the top ten (although there are plenty more) things I'm inspired by. One of my all-time favorite designers/illustrators, partially because he successfully is both a designer and illustrator and seamlessly combines the two. I especially like his process of illustrating on the computer, but using textures and hand-drawn lines and type to keep his pieces from looking vector-y. He incorporates humor into his work and keeps everything simple. I appreciate the words of wisdom he puts on his website, like " Does it have heart? If it does, make it. If it doesn't, why spend the time on something that doesn't have spirit?" One of my favorite illustrators, his work is so highly stylized. I love his use of geometric shapes, patterns, lines, and texture to simplify figures while maintaining an interesting and overall complex image. I also am always drawn to illustrators who work from nature. While I want to pursue graphic design in general, packaging design is something I'm particularly interested in. I especially like unique designs, packaging with bold colors and type, clear concepts and styles, and designs that are clever without being cheesy. I love the combination of flat graphics with screenprint-like textures and line details. I like the relatively subdued color palettes, the variety of typography, and the simplicity, geometry and playfulness of the settings, people, animals, etc. I especially admire the work of Paul Rand, Alain Gree, Alexander Girard, Saul Bass, Richard Erdoes, Fiep Westendorp, and more. 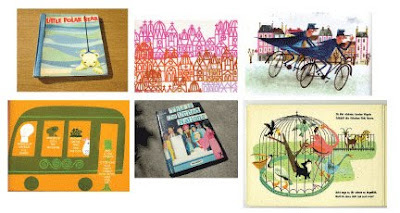 Many of my favorite current illustrators work in a similar style to these vintage graphics (Lab Partners, Jen Corace, Jim Datz, Jenn Ski, Adrian Johnson, Tad Carpenter, Sanna Paananen, s.Britt, Richard Perez, Ward Jenkins, and more). This is my minor and I’m fascinated with different cultures and why people do the things they do – specifically in regards to consumption, advertising, social relations, middle-class existence, the environment/nature, media and pop culture, public vs. private spaces, food practices, and traditions. I like the originality, imperfections, and roughness that comes from handcrafting type. I like the retro or vintage feel of it and the way it can be incorporated into patterns or illustrations. 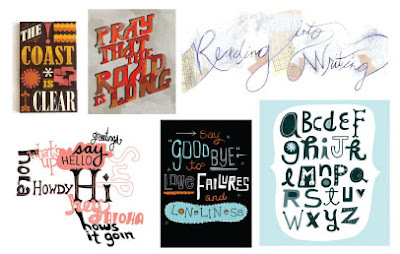 Some of my favorite artists/illustrator's that create handwritten type are Darren Booth, Linzie Hunter, Jeff Canham, Sarah Watts, Jessica Hische, and Marian Bantjes. 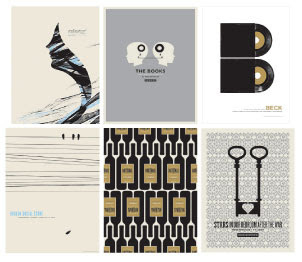 Jason Munn is the man behind poster shop, The Small Stakes. I like his use of found imagery, silhouettes and hand drawn elements. I also like the way he transforms the band’s personalities and music styles into a simple graphic form. I like the overall sense that each piece seems to have a narrative. Other excellent poster shops: Aesthetic Apparatus and Spike Press. I like the use of black, white, and often red, the use of minimalist symbols like silhouettes, and the way in which he incorporated text into the images. 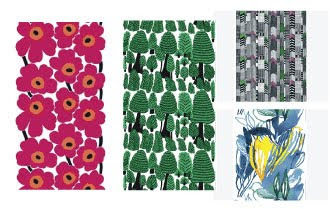 I like the repetition of large, bold patterns on these textiles as well as the frequent theme of using objects from nature and other environments. Long enough for one entry? I think so.